Inter School Quiz Competition (10th August, 2013) : 34 students from Classes VII to XI participated in (Inter school Quiz Competition” organized by office of the Deputy Commission, Dibrugarh District, Govt. Of Assam. Swimming Competition (27th July, 2013 ) : Gracy Rajkonwar of Class IV participated in Hemendra Nath Boruah & Rina Boruah memorial swimming competition, 2013 held at Little Mermaid Swimming Pool on 27th July, 2013 and secured 1st position in 20 metres (free style), 20 metres (Back stroke) and 40 metres (free style) group. Art Competition ( 15th August, 2013) : Dharmista Buragohain of class V has secured 2nd position in Art Competition held at Durgabari Puja Mandap on 15th August, 2013 organised by Young United Volunteers of Assam. TSC Thal Sainik Camp (16th August to 5th September, 2013) : Mayurdeep Paul of class VIII – B went for the NCC – TSC Thal Sainik Camp at Dergaon Police Reserve. He attended 2 camps for 20 days. He went on 16th August, 2013 and came back on 5th September, 2013. Essay Competition ( 17th August, 2013) : Sourav Dey (XII Com) participated in all India Level Essay Competition organized by Bharat Bikash Parishad on 17th August, 2013. Essay Competition was conducted to commemorate 150th Birth Anniversary of Swami Vivekananda. Quiz Competition ( 25th August, 2013) : Bharat Bikash Parishad organized the Branch level Bharat Ko Jano Quiz competition on 25th August, 2013 at Dibrugarh Govt. H.S. School. Two groups from our school participated. Winner Group : Senior Group has won the 1st prize in Quiz Competition. National Group Song Competition ( 25th August, 2013) : Bharat Bikash Parishad also organized a National Group Song Competition on 25th August, 2013. Winner : VKV Dibrugarh begged 3rd Prize in all the three categories of song competition. Names of the Participants : Adrita Bhuyan, Boinasmita Boruah, Chandrika Barman, Dixsha Hazarika, Kantadarshi Sharma, Nikita Das, Rituparna Buragohain, Tejaswinee Boruah. NCC Competition : 10 Assam BN NCC, Dibrugarh conducted CATC combined Annual Training Camp of National Cadet Crops. 14 students from our Vidyalaya participated in various programmes like speech, Quiz, handwriting, essay, Drawing, group song and also in shooting. 1. Subaran Bhattacharjee of Class IX A has received 1st prize in both essay and Quiz Competition. 2. Achinta Dey of Class IX B has received 2nd prize in both essay and speech competition. 3. Shekharjyoti Lahon of Class IX B has received 1st Prize in handwriting and 2nd Prize in shooting. 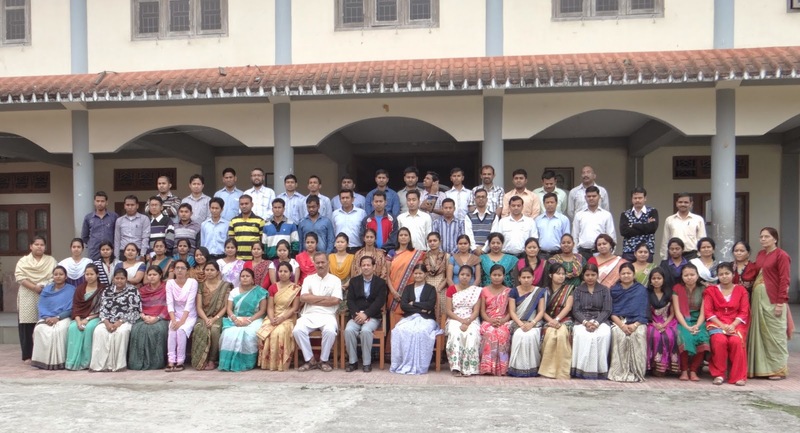 19th October, 2013 to 28th October, 2013 : A NCC Cadre training camp known as CCT – IV was organised at JNV, Dumordolong. 6 students from our school participated in our camp. In the camp various competitions were held. Subarna Bannerjee of Class IX bagged the 1st prize in Quiz Competition and 3rd prize in Speech Compeition. 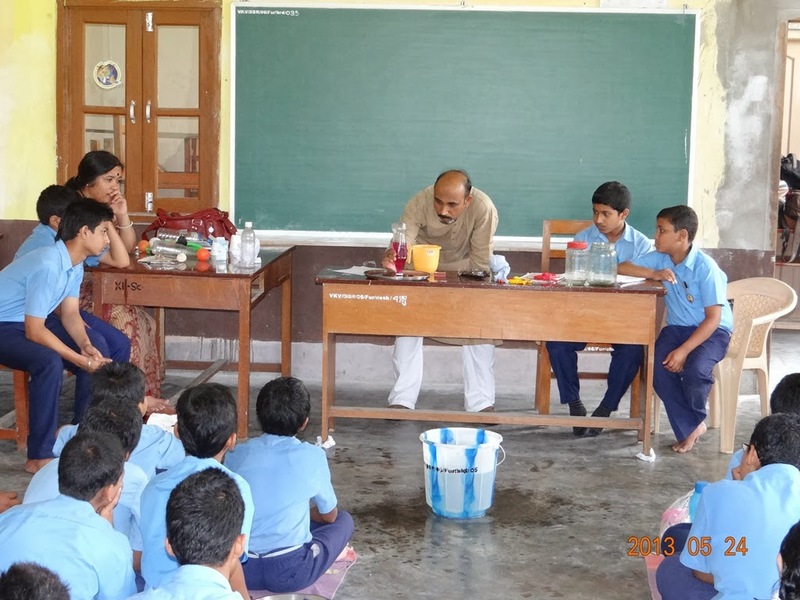 23rd October, 2013 : Conducting the Gyan Setu programme by volunteers for the Raidongia ME School and headed by one of our senior teacher, Sri Ajit Kumar Sahu. The programme was organised by Educational Acvtivity Research Center (EARC), aiming at spreading joy of education among children, by conducting science based workshops and camps for middle school students. 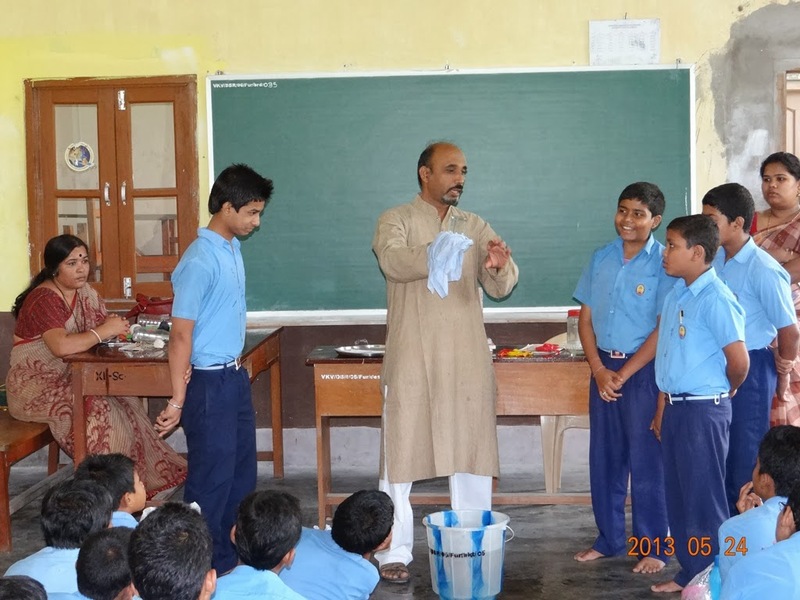 The same programme was conducted at another school on the same day Nehru ME school for 3 hours. Art and Speech competition (10th November, 2013) :- On account of Gopastami at Shree Gopal Gosala at Chiring Chapori they have organised a art and speech competition where students from different schools participated. Our students of VKV Dibrugarh begged away the 1st prize in speech competition and 2nd & 3rd prize in art competition. Painting Competition (16th November, 2013) :- A painting competition for kids 2013 was organised by Axis Bank, Dibrugarh Branch where students from various schools of Dibrugarh participated. Our student of VKV Dibrugarh got 1st Prize. Design A Stamp Contest (17th November, 2013) :- Department of Post at GPO. The contest was based on “ On the spot Design a Stamp” topic “ A Day with my Grand Parents”. Deepika Das of Class VI has been awarded 2nd Prize. Art Competition (24th November, 2013) :- An Art competition was organised for 8th Dibrugarh Book Fair, 2013 by Milan Jyoti Sangha in association with All Assam Publishers and Book Sellers Association with a trophy and a Cash Prize of Rs. 10,000/-. Many students from different schools participated from where our student Proniket Choudhury of Class VII – B got 1st Prize. 15th to 22nd November, 2013 :– The Uttar Pradesh Track held at 25th Battalion, Shahjahanpur was held from 15th to 22nd Nov, 2013 which was attended by our Physical Trainer Sri Prasanta Kumar Nath. The next was held at Patiala where he had joined along with 38 cadets from other colleges.